In 1969 scientists at the University of California, Los Angeles, transmitted a couple of bits of data between two computers, and thus the Internet was born. Today about 2 billion people access the Web regularly, zipping untold exabytes of data (that’s 1018 pieces of information) through copper and fiber lines around the world. In the United States alone, an estimated 70 percent of the population owns a networked computer. That number grows to 80 percent if you count smartphones, and more and more people jump online every day. But just how big can the information superhighway get before it starts to buckle? How much growth can the routers and pipes handle? The challenges seem daunting. The current Internet Protocol (IP) system that connects global networks has nearly exhausted its supply of 4.3 billion unique addresses. Video is projected to account for more than 90 percent of all Internet traffic by 2014, a sudden new demand that will require a major increase in bandwidth. Malicious software increasingly threatens national security. And consumers may face confusing new options as Internet service providers consider plans to create a “fast lane” that would prioritize some Web sites and traffic types while others are routed more slowly. Fortunately, thousands of elite network researchers spend their days thinking about these thorny issues. Last September DISCOVER and the National Science Foundation convened four of them for a lively discussion, hosted by the Georgia Institute of Technology in Atlanta, on the next stage of Internet evolution and how it will transform our lives. DISCOVER editor in chief Corey S. Powell joined Cisco’s Paul Connolly, who works with Internet service providers (ISPs); Georgia Tech computer scientist Nick Feamster, who specializes in network security; William Lehr of MIT, who studies wireless technology, Internet architecture, and the economic and policy implications of online access; and Georgia Tech’s Ellen Zegura, an expert on mobile networking (click here for video of the event). Powell: Few people anticipated Google’s swift rise, the vast influence of social media, or the Web’s impact on the music, television, and publishing industries. How do we even begin to map out what will come next? Lehr: One thing the Internet has taught us thus far is that we can’t predict it. That’s wonderful because it allows for the possibility of constantly reinventing it. Zegura: Our response to not being able to predict the Internet is to try to make it as flexible as possible. We don’t know for sure what will happen, so if we can create a platform that can accommodate many possible futures, we can position ourselves for whatever may come. The current Internet has held up quite well, but it is ready for some changes to prepare it to serve us for the next 30, 40, or 100 years. By building the ability to innovate into the network, we don’t have to know exactly what’s coming down the line. That said, Nick and others have been working on a test bed called GENI, the Global Environment for Network Innovations project that will allow us to experiment with alternative futures. Powell: Almost like using focus groups to redesign the Internet? Zegura: That’s not a bad analogy, although some of the testing might be more long-term than a traditional focus group. Powell: What are some major online trends, and what do they suggest about where we are headed? Feamster: We know that paths are getting shorter: From point A to point B, your traffic is going through fewer and fewer Internet service providers. And more and more data are moving into the cloud. Between now and 2020, the number of people on the Internet is expected to double. For those who will come online in the next 10 years or so, we don’t know how they’re going to access the Internet, how they’re going to use it, or what kinds of applications they might use. One trend is the proliferation of mobile devices: There could be more than a billion cell phones in India alone by 2015. Powell: So there’s a whole universe of wireless connectivity that could potentially become an Internet universe? Feamster: Absolutely. We know things are going to look vastly different from people sitting at desktops or laptops and browsing the Web. Also, a lot of Internet innovation has come not from research but from the private sector, both large companies and start-ups. As networking researchers, we should be thinking about how best to design the network substrate to allow it to evolve, because all we know for sure is that it’s going to keep changing. Powell: What kind of changes and challenges do you anticipate? Lehr: We’re going to see many different kinds of networks. 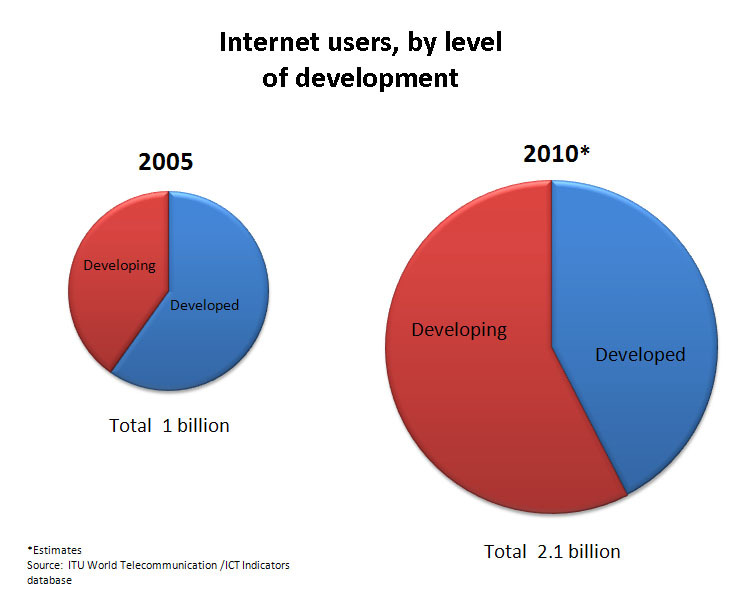 As the Internet pushes into the developing world, the emphasis will probably be on mobile networks. For now, the Internet community is still very U.S.-centric. Here, we have very strong First Amendment rights (see “The Five Worst Countries for Surfing the Web,” page 5), but that’s not always the case elsewhere in the world, so that’s something that could cause friction as access expands. Powell: Nearly 200 million Americans have a broadband connection at home. The National Broadband Plan proposes that everyone here should have affordable broadband access by 2020. Is private industry prepared for this tremendous spike in traffic? Connolly: Our stake in the ground is that global traffic will quadruple by 2014, and we believe 90 percent of consumer traffic will be video-based. The question is whether we can deal with all those bits at a cost that allows stakeholders to stay in business. The existing Internet is not really designed to handle high volumes of media. When we look at the growth rate of bandwidth, it has followed a consistent path, but you have to focus on technology at a cost. If we can’t hit a price target, it doesn’t go mainstream. When we hit the right price, all of a sudden people say, “I want to do that,” and away we go. Powell: As networks connect to crucial systems—such as medical equipment, our homes, and the electrical grid—disruptions will become costly and even dangerous. How do we keep everything working reliably? Lehr: We already use the cyber world to control the real world in our car engines and braking systems, but when we start using the Internet, distributed networks, and resources on some cloud to make decisions for us, that raises a lot of questions. One could imagine all kinds of scenarios. I might have an insulin pump that’s controlled over the Internet, and some guy halfway around the world can hack into it and change my drug dosage. Feamster: The late Mark Weiser, chief technologist at the Xerox Palo Alto Research Center, said the most profound technologies are the ones that disappear. When we drive a car, we’re not even aware that there’s a huge network under the hood. We don’t have to know how it works to drive that car. But if we start networking appliances or medical devices and we want those networks to disappear in the same way, we need to rely on someone else to manage them for us, so privacy is a huge concern. How do I give someone visibility and access so they can fix a problem without letting them see my personal files, or use my printer, or open my garage door? The issues that span usability and privacy are going to become increasingly important. Zegura: I would not be willing to have surgery over the Internet today because it’s not secure or reliable enough. Many environments are even more challenging: disaster situations, remote areas, military settings. But many techniques have been developed to deal with places that lack robust communications infrastructure. For instance, my collaborators and I have been developing something called message ferries. These are mobile routers, nodes in the environment that enable communication. Message ferries could be on a bus, in a backpack, or on an airplane. Like a ferry picks up passengers, they pick up messages and deliver them to another region. Powell: Any takers for surgery over the Internet? Show of hands? Lehr: If I’m in the Congo and I need surgery immediately, and that’s the only way they can give it to me, sure. Is it ready for prime time? Absolutely not. Powell: Many Web sites now offer services based on “cloud computing.” What is the concept behind that? Feamster: One of the central tenets of cloud computing is virtualization. What that means is that instead of having hardware that’s yours alone, you share it with other people, whom you might not trust. This is evident in Gmail and Google Docs. Your personal documents are sitting on the same machine with somebody else’s. In this kind of situation, it’s critical to be able to track where data go. Several of my students are working on this issue. Powell: With more and more documents moving to the cloud, aren’t there some complications from never knowing exactly where your data are or what you’re connecting to? Lehr: A disconnect between data and physical location puts providers in a difficult position—for example, Google deciding what to do with respect to filtering search results in China. It’s a global technology provider. It can potentially influence China’s rules, but how much should it try to do that? People are reexamining this issue at every level. Powell: In one recent survey, 65 percent of adults in 14 countries reported that they had been the victim of some type of cyber crime. What do people need to know to protect themselves? Feamster: How much do you rely on educating users versus shielding them from having to make sensitive decisions? In some instances you can prevent people from making mistakes or doing malicious things. Last year, for instance, Goldman Sachs was involved in a legal case in which the firm needed to show that no information had been exchanged between its trading and accounting departments. That’s the kind of thing that the network should just take care of automatically, so it can’t happen no matter what users do. Zegura: I agree that in cases where it’s clear that there is something people should not do, and we can make it impossible to do it, that’s a good thing. But we can’t solve everything that way. There is an opportunity to help people understand more about what’s going on with networks so they can look out for themselves. A number of people don’t understand how you can get e-mail that looks like it came from your mother, even though it didn’t. The analogy is that someone can take an envelope and write your name on it, write your mother’s name on the return address, and stick it in your mailbox. Now you have a letter in your mailbox that looks like it came from your mother, but it didn’t. The same thing can happen with e-mail. It’s possible to write any address on an Internet packet so it looks like it came from somewhere else. That’s a very basic understanding that could help people be much smarter about how they use networks. Audience: How is the Internet changing the way we learn? Feamster: Google CEO Eric Schmidt once gave an interview in which he was talking about how kids are being quizzed on things like country capitals (video). He essentially said, “This is ridiculous. I can just go to Google and search for capitals. What we really should be teaching students is where to find answers.” That’s perhaps the viewpoint of someone who is trying to catalog all the world’s information and says, “Why don’t you use it?” But there’s something to be said for it—there’s a lot of data at our fingertips. Maybe education should shift to reflect that. Audience: Do you think it will ever be possible to make the Internet totally secure? Feamster: We’ll never have perfect security, but we can make it tougher. Take the problem of spam. You construct new spam filters, and then the spammers figure out that you’re looking for messages sent at a certain time or messages of a certain size, so they have to shuffle things up a bit. But the hope is that you’ve made it harder. It’s like putting up a higher fence around your house. You won’t stop problems completely, but you can make break-ins inconvenient or costly enough to mitigate them. Audience: Should there be limits on how much personal information can be collected online? Zegura: Most of my undergraduate students have a sensitivity to private information that’s very different from mine. But even if we’re savvy, we can still be unaware of the personal data that some companies collect. In general, it needs to be much easier for people to make informed choices. Feamster: The thing that scares me the most is what happens when a company you thought you trusted gets bought or goes out of business and sells all of your data to the lowest bidder. There are too few regulations in place to protect us, even if we understand the current privacy policies. Lehr: Technologically, Bill Joy﻿ [co-founder of Sun Microsystems] was right when he said, “Privacy is dead; just get over it.” Privacy today can no longer be about whether someone knows something, because we can’t regulate that effectively. What matters now is what they can do with what they know. Audience: Wiring society creates the capacity to crash society. The banking system, utilities, and business administration are all vulnerable. How do we meaningfully weigh the benefits against the risks? Lehr: How we decide to use networks is very important. For example, we might decide to have separate networks for certain systems. I cannot risk some kid turning on a generator in the Ukraine and blowing something up in Kentucky, so I might keep my electrical power grid network completely separate. This kind of question engages more than just technologists. A wider group of stakeholders needs to weigh in. Connolly: You always have to balance the good versus the potential for evil. Occasionally big blackouts in the Northeast cause havoc, but if we decided not to have electricity because of that risk, that would be a bad decision, and I don’t think it’s any worse in the case of the Internet. We have to be careful, but there’s so much possibility for enormous good. The power of collaboration, with people working together through the Internet, gives us tremendous optimism for the kinds of issues we will be able to tackle. A good place to start is with the overburdened addressing system, known as IPv4. Every device connected to the Internet, including computers, smartphones, and servers, has a unique identifier, or Internet protocol (IP) address. “Whenever you type in the name of a Web site, the computer essentially looks at a phone book of IP addresses,” explains Craig Labovitz, chief scientist at Arbor Networks, a software and Internet company. “It needs a number to call to connect you.” Trouble is, IPv4 is running out of identifiers. In fact, the expanding Web is expected to outgrow IPv4’s 4.3 billion addresses within a couple of years. Anticipating this shortage, researchers began developing a new IP addressing system, known as IPv6, more than a decade ago. IPv6 is ready to roll, and the U.S. government and some big Internet companies, such as Google, have pledged to switch over by 2012. But not everyone is eager to follow. For one, the jump necessitates costly upgrades to hardware and software. Perhaps a bigger disincentive is the incompatibility of the two addressing systems, which means companies must support both versions throughout the transition to ensure that everyone will be able to access content. In the meantime, IPv4 addresses, which are typically free, may be bought and sold. For the average consumer, Labovitz says, that could translate to pricier Internet access. In one GENI experiment, Stanford University researcher Kok-Kiong Yap is researching a futuristic Web that seamlessly transitions between various cellular and WiFi networks, allowing smartphones to look for an alternative connection whenever the current one gets overwhelmed. That’s music to the ears of everyone toting an iPhone. As Nick Feamster says, the cloud is an increasingly popular place to store data. So much so, in fact, that technology research company Gartner predicts the estimated value of the cloud market, including all software, advertising, and business transactions, will exceed $150 billion by 2013. Why the boom? Convenience. At its simplest, cloud computing is like a giant, low-cost, low-maintenance storage locker. Centralized servers, provided by large Internet companies like Microsoft, Google, and Amazon, plus scores of smaller ones worldwide, let people access data and applications over the Internet instead of storing them on personal hard drives. This reduces costs for software licensing and hardware. While much of the data that zips around the Internet is free, the routers and pipes that enable this magical transmission are not. The question of who should pay for rising infrastructure costs, among other expenses, is at the heart of the long-standing net neutrality debate. On the one side, Internet service providers argue that charging Web sites more for bandwidth-hogging data such as video will allow them to expand capacity and deliver data faster and more reliably. Opponents counter that such a tiered or “pay as you go” Internet would unfairly favor wealthier content providers, allowing the richest players to indirectly censor their cash-strapped competition. So which side has the legal edge? Last December the Federal Communications Commission approved a compromise plan that would allow ISPs to prioritize traffic for a fee, but the FCC promises to police anticompetitive practices, such as an ISP’s mistreating, say, Netflix, if it wants to promote its own instant-streaming service. The extent of the FCC’s authority remains unclear, however, and the ruling could be challenged as early as this month. A message ferry is a mobile device or Internet node that could relay data in war zones, disaster sites, and other places lacking communications infrastructure. Unfortunately for WikiLeaks, Amazon is not a government agency, so there is no First Amendment case against it, according to Internet scholar and lawyer Wendy Seltzer of Princeton University. You may be doing something perfectly legal on Amazon’s cloud, Seltzer explains, and Amazon could give you the boot because of government pressure, protests, or even too many service calls. “Service providers give end users very little recourse, if any,” she observes. That’s why people are starting to think about “distributed hosting,” in which no one company has total power, and thus no one company controls freedom of speech. Nick Feamster’s strategy is to tag sensitive information with irrevocable digital labels. For example, an employee who wants only his boss to read a message could create a label designating it as secret. That label would remain with the message as it passed through routers and servers to reach the recipient, preventing a snooping coworker from accessing it. “The file could be altered, chopped in two, whatever, and the label would remain with the data,” Feamster says. The label would also prohibit the boss from relaying the message to someone else. Feamster expects to unveil a version of his labeling system, called Pedigree, later this year. A lot of it. Spam accounts for about 85 percent of all e-mail. That’s more than 50 billion junk messages a day, according to the online security company Symantec. As we cope with the cruel fact that the Internet never forgets, researchers are looking toward self-destructing data as a possible solution. Vanish, a program created at the University of Washington, encodes data with cryptographic tags that degrade over time like vanishing ink. A similar program, aptly called TigerText, allows users to program text messages with a “destroy by” date that activates once the message is opened. Another promising option, of course, is simply to exercise good judgment. Crowdsourcing science projects that harness the power of the wired masses have tremendous potential to quickly solve problems that would otherwise take years to resolve. Notable among these projects is Foldit (fold.it), an engaging online puzzle created by Seth Cooper of the University of Washington and others that tasks gamers with figuring out the shapes of hundreds of proteins, which in turn can lead to new medicines. Another is the UC Berkeley Space Sciences Lab’s Stardust@home project (stardustathome.ssl.berkeley.edu), which has recruited about 30,000 volunteers to scour, via the Internet, microscope images of interstellar dust particles collected from the tail of a comet that may hold clues to how the solar system formed. And Cornell University’s NestWatch (nestwatch.org) educates people about bird breeding and encourages them to submit nest records to an online database. To date, the program has collected nearly 400,000 nest records on more than 500 bird species. It’s hard to surf the Web when there is no Web to surf. Very few North Koreans have access to the Internet; in fact, due to the country’s isolation and censorship, many of its citizens do not even know it exists﻿. Burma is the worst country in which to be a blogger, according to a 2009 report by the Committee to Protect Journalists. Blogger Maung Thura, popularly known in the country as Zarganar, was sentenced to 35 years in prison for posting content critical of the government’s aid efforts after a hurricane. The Iranian government employs an extensive Web site filtering system, according to the press freedom group Reporters Without Borders, and limits Internet connection speeds to curb the sharing of photos and videos. Following the controversial 2009 reelection of president Mahmoud Ahmadinejad, protesters flocked to Twitter to voice their displeasure after the government blocked various news and social media Web sites. Only 14 percent of Cubans have access to the Internet, and the vast majority are limited to a government-controlled network made up of e-mail, an encyclopedia, government Web sites, and selected foreign sites supportive of the Cuban dictatorship. Last year Cuban officials accused the United States of encouraging subversion by allowing companies to offer Internet communication services there.